Stroke is the second and the leading most common cause of death in the world and China, respectively, but with few effective therapies. Nicotinamide phosphoribosyltransferase (NAMPT) is the rate-limiting enzyme for nicotinamide adenine dinucleotide (NAD) salvage synthesis in mammals, thereby influencing NAD-dependent enzymes and constituting a strong endogenous defence system against various stresses. Accumulating in-vitro and in-vivo studies have demonstrated the neuroprotective effect of NAMPT in stroke. Here, we review the direct evidence of NAMPT as a promising target against stroke from five potential therapeutic strategies, including NAMPT overexpression, recombinant NAMPT, NAMPT activators, NAMPT enzymatic product nicotinamide mononucleotide (NMN), and NMN precursors nicotinamide riboside and nicotinamide, and describe the relevant mechanisms and limitations, providing a promising choice for developing novel and effective therapeutic interventions against ischaemic and haemorrhagic stroke. Stroke is the second most common cause of death1,2 and the third most common cause of disability-adjusted life-years (DALYs) worldwide,3 and the leading cause of death in China,4,5 with characteristics of high morbidity, high mortality, high disability rate, high recurrence rate and high medical expenses6 (box 1). Of all stroke case, approximately 78% are ischaemic stroke and others are haemorrhagic stroke.2 There is only one drug, tissue plasminogen activator (tPA), approved by Food and Drug Administration for the treatment of ischaemic stroke and no available drug for the treatment of haemorrhagic stroke. And, due to the narrow treatment window, contraindications and risk of complications, tPA is applicable for only about 3%–5% of stroke patients who meet the treatment criteria.2,7 Therefore, there is an urgent need for developing new and effective therapies for stroke patients. Stroke has a complex pathophysiology, which can cause a cascade of injury reactions with eventually cell death after the onset.2,8 At the same time, stroke can also mobilise the body’s defence mechanisms against impairments of stroke by improving cell survival, neurogenesis and functional recovery.2,9 Many previous studies have focused on the stroke injury mechanisms of excitotoxicity, oxidative and nitrosative stress, and inflammation to develop neuroprotective agents against stroke.2,10 However, these therapeutic strategies are still in the preclinical-to-clinical transition. Targeting the endogenous defence mechanisms against stroke has been received attention in the recent decade and considered as a novel target of stroke treatment. Stroke is the second most common cause of death1,2 and the third most common cause of disability-adjusted life years (DALYs)3 worldwide. In the Global Burden of Diseases, Injuries, and Risk Factors Study (GBD, 2010), an estimated 16.9 million incident strokes occurred in 2010, which added to a pool of 33 million stroke worldwide.6,9 Although mortality rates and mortality-to-incidence ratios of stroke have decreased in the past two decades, the absolute number of people affected every year, stroke survivors, related deaths and DALYs lost are still increasing, particularly in low-income and middle-income countries.6 By 2030, there will be almost 12 million stroke deaths, 70 million stroke survivors, and more than 200 million DALYs lost globally6 with the continuing trend of stroke incidence, mortality and DALYs.6 In contrast to Western populations, stroke is the leading cause of death in China, where it accounted for 22.5% of deaths (about 2 million) in 2005.4 With the trends of increased stroke mortality in China, the death number will be doubled from 2 to 4 million in the next two decades.5 Having more than one-sixth of the world’s population, China has heavy personal, social and financial costs of stroke and related diseases in the context of having a high prevalence of stroke. Therapeutic strategies targeting NAMPT against stroke. There are two ways to maintain the cellular NAD level in mammals: the de novo pathway from tryptophan and the salvage pathway from NAM, NR and NA with different catalysing enzymes. NAMPT is the rate-limiting enzyme of NAD synthesis in the salvage pathway, thereby influencing NAD-dependent enzymes and regulating cellular metabolism, mitochondrial biogenesis and the adaptive response to inflammatory, oxidative, proteotoxic and genotoxic stresses. Accumulating in-vitro and in-vivo studies indicate that NAMPT is a therapeutic target against stroke from five potential therapeutic strategies: NAMPT overexpression, recombinant NAMPT, NAMPT activators, NAMPT enzymatic product NMN, NMN precursors NR and NAM. In ischaemic stroke, targeting NAMPT can confer neuroprotection via regulating mitochondrial biogenesis, activating SIRT1, inhibiting PARP1 activity and mimicking IPC. And, NAMPT related treatment exerts biological function in EPCs and NSCs to promote neovascularization and neurogenesis after ischaemic stroke. Remarkably, there is positive evidence of NAMPT in ICH, wherein NMN treatment can attenuate brain injury by activating Nrf2/HO-1 signalling pathway in the mouse model of cICH, and protect BBB integrity and attenuate brain infarction and haemorrhage in the mouse model of tPA-ICH, indicating NAMPT mediated neuroprotection in ICH. These preclinical evidences indicate targeting NAMPT can be a promising choice for developing novel and effective therapeutic interventions against stroke. BBB, blood–brain barrier; cICH, collagenase-induced intracerebral haemorrhage; EPCs, endothelial progenitor cells; IPC, ischaemic preconditioning; NA, nicotinic acid; NAD, nicotinamide adenine dinucleotide; NAM, nicotinamide; NAMN, nicotinic acid mononucleotide; NAMPT, nicotinamide phosphoribosyltransferase; NAPRT, nicotinic acid phosphoribosyltransferase; NMN, nicotinamide mononucleotide; NMNAT, nicotinamide mononucleotide adenylyltransferase; NR, nicotinamide riboside; NRK, nicotinamide ribose kinase; NSCs, neural stem cells; PARPs, poly-ADP-ribose polymerases; QAPRT, quinolinate phosphoribosyltransferase; SIRTs, sirtuins; tPA-ICH, tPA-induced cerebral infarction haemorrhagic transformation. Amount of preclinical studies has demonstrated targeting NAMPT can strongly suppress ischaemia-neuronal injury to exert neuroprotection in the acute phase of ischaemic stroke, and promote neovascularisation and neurorestoration in the sub-acute and chronic phase of ischaemic stroke (figure 1). Moreover, in the two models of intracerebral haemorrhage (ICH), collagenase-induced ICH (cICH) and tPA-induced haemorrhagic transformation after ischaemic stroke (tPA-ICH), NAMPT enzymatic product nicotinamide mononucleotide (NMN) exerts neuroprotection (figure 1). In this review, we summarise direct evidence of NAMPT as a target against stroke from five therapeutic strategies, including NAMPT overexpression, recombinant NAMPT, NAMPT activators, NAMPT enzymatic product NMN, and NMN precursors nicotinamide riboside (NR) and nicotinamide (NAM), and describe the relevant mechanisms, demonstrating the therapeutic value of NAMPT-related agents in the treatment of stroke (figure 1). In addition, we discuss the limitations of NAMPT in stroke, hoping to promote the preclinical-to-clinical translation of NAMPT-related agents in ischaemic and haemorrhagic stroke. Moreover, we also investigated the effect of a potential NAMPT stimulator P7C3-A20 on ischaemic stroke.40 P7C3-A20, an aminopropyl carbazole derivative, has been reported to have proneurogenic and neuroprotective effects in various brain disease models.11 In the successive studies, P7C3-A20 is found to protect hippocampal mature neurons and substantia nigra dopaminergic neurons from cell death in the Parkinson’s Disease model, protect ventral horn spinal cord motor neurons from cell death in the Amyotrophic Lateral Sclerosis model, augment hippocampal neurogenesis following focal ablation of hippocampal stem cells in the depression-prone ghrelin receptor-null mouse model, and increase proliferating neurons and improve cognitive function after traumatic brain injury.11 Combined with these studies and the enhanced flux of NAD by P7C3 compounds in mammalian cells, P7C3 family is proposed as a therapeutic approach to treat cerebral ischaemia. As such, our group first demonstrated P7C3-A20 increases neuronal viability in the in-vitro OGD model, and reduces cerebral infarction and restores the brain NAD level in the in-vivo MCAO model of acute ischaemic stroke.40 Further, the effectiveness of P7C3-A20 treatment on chronic histopathological and behavioural outcomes and neurogenesis after ischaemic stroke has been also explored.41,42 P7C3-A20 treatment for 7 days immediately after MCAO improves rat performance in sensorimotor cylinder and grid-walk tasks, and in a chronic test of spatial learning and memory after stroke. P7C3-A20 treatment also significantly decreases cortical and hippocampal atrophy, increases neurogenesis in the SVZ and hippocampal DG, and restores NAD to sham level after ischaemic stroke.41 Moreover, delayed P7C3-A20 treatment, at 6-hour post-reperfusion of MCAO, significantly improves stroke-induced sensorimotor deficits in motor coordination and symmetry, as well as cognitive deficits in hippocampus-dependent spatial learning, memory retention, and working memory. In the cerebral cortex, delayed P7C3-A20 treatment significantly increases tissue sparing at 7 weeks after stroke and reduces hemispheric infarct volumes at 48 hours post-reperfusion.42 Importantly, P7C3-A20 treatment in adult male rhesus monkeys for 38 weeks provides sustained plasma exposure, well tolerates and safely elevates BrdU+ survival neurons in the hippocampus of non-human primates, suggesting that the neuroprotective efficacy of P7C3 compounds is likely to translate to humans as well.43 Besides, in a paclitaxel-induced peripheral neuropathy model, P7C3-A20 abrogates neuropathic pain, protects peripheral nociceptive neurons from damage, improves general health, reduces attrition associated with PTX treatment and enhances NAMPT-mediated NAD recovery in response to cellular damage.44 And those beneficial effects can be abolished by the NAMPT inhibitor, suggesting the augmentation of NAMPT activity is required for P7C3-A20-mediated neuroprotection.44 Taken together, P7C3-A20 may be new therapeutic approach for stroke via the augmentation of NAD level and NAMPT activity, which safely augments NAD level in vivo and protect from neuronal injury in the acute and chronic phase of stroke. Taken together, as an endogenous substance with relatively high safety, NMN can be a promising drug candidate for the treatment of ischaemic and haemorrhagic stroke. In the rat model of permanent MCAO, NAM reduces neuronal infarction in a dose-specific manner and reduces infarcts when administered up to 2 hours after the onset of permanent occlusion.52 And, NAM can delay the onset of stroke and reduce infarction volume when administrated to stroke-prone spontaneously hypertensive rats before the ischaemic event.53 NAM pretreatment plays antioxidative action and alleviates mitochondrial membrane potential in the infarct penumbra induced by MCAO.53 It is important to realise that NAM shows opposite effects with different dosage. In one dosage-reaction study of rat temporary MCAO model, NAM treatment at 20 mg/kg within 0–6 hour after reperfusion shows potent neuroprotective effects, but administration of NAM 60 mg/kg at the onset of reperfusion drastically accelerates brain damage.54 The diverse functions with NAM treatment may be due to the role of NAM in different signalling, wherein NAM not only inhibit PARP,55 but also inhibit the activity of the SIRT2 family of histone/protein deacetylases.56 Recently, it is reported that NAM administration significantly reduces infarct area and enhances fractional anisotropy in the ipsilesional internal capsule induction than the other groups at 7 and 14 days after stroke, respectively.57 NAM also promotes the expression of NAD+, BDNF and remyelination markers and improve functional recovery, which can be abolished by the administration of NAMPT inhibitor FK866 or TrκB antagonist ANA-12.57 Therefore, NAM administration improves remyelination after stroke via the NAD+/BDNF/TrκB pathway. Above evidence demonstrated NAMPT is a promising target for developing therapeutic interventions against ischaemic stroke and haemorrhagic stroke. Although the safety of P7C3-A20 has been studied in adult male rhesus monkeys, the efficacy of above NAMPT-related agents is still in the preclinical study phase, primarily studied in the in-vivo MCAO model of rodent animals and in-vitro OGD model of primary cortical neurons. Recent breakthroughs in human pluripotent stem cell-derived humanised neurons and cerebral organoids not only show potential in the replacement for expensive non-human primate animals, but also provide a valuable platform for investigating the neuroprotection of NAMPT in humanised stroke model. Further studies need to answer the efficacy of NAMPT-related agents in the humanised neurons/cerebral organoids, non-human primates and ultimately humans. Besides, the role of NAMPT in stroke is only explored as monotherapy. It is still unclear whether NAMPT-based combination therapy with other neuroprotective agent or anti-inflammatory treatment is more effective to cure stroke. Accumulating in-vitro and in-vivo studies indicate that NAMPT is a therapeutic target in ischaemic stroke. NAMPT–NAD signalling represents a strong endogenous defence system against ischaemia-induced energy deletion, neural cell death, and eventually brain infarction. Our group also provides first-hand evidence of NAMPT in ICH, wherein NMN attenuates brain injury after ICH by activating Nrf2/HO-1 signalling pathway, and protects BBB integrity and attenuates delayed tPA-induced haemorrhagic transformation after cerebral ischaemia. 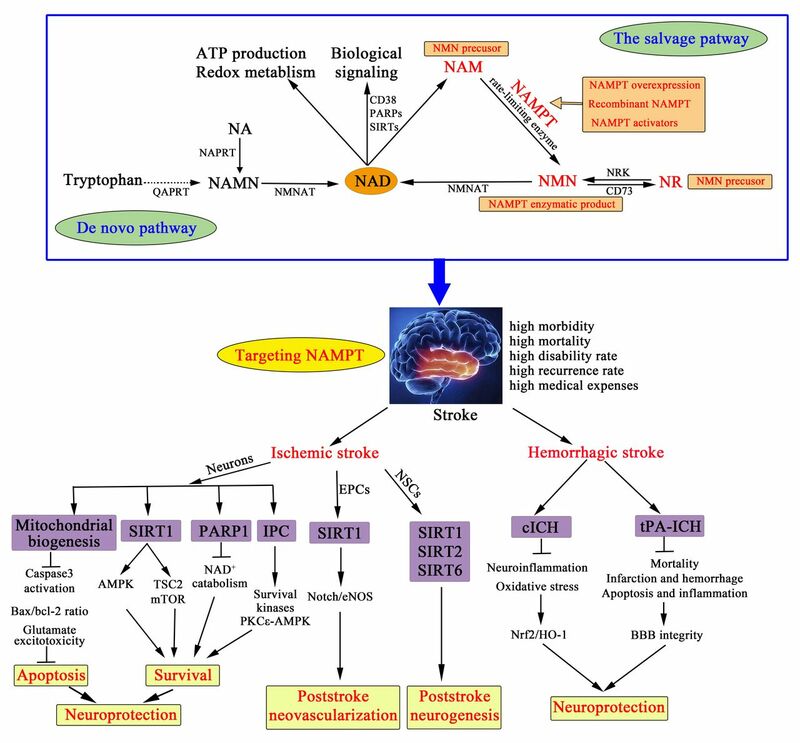 From the elaboration of NAMPT overexpression, recombinant NAMPT, NAMPT activators, NAMPT enzymatic product NMN, NMN precursors NR and NAM in stroke, targeting NAMPT can be a promising choice for developing novel and effective therapeutic interventions against stroke. For further preclinical-to-clinical translation, future work is needed to answer more scientific questions, especially the effect of NAMPT-related agents in the humanised neurons/brains or non-human primates, providing substantial preclinical evidence to promote new drug discovery of stroke treatment.
. Neuroprotective effects of poly (ADP-ribose) polymerase inhibitors in transient focal cerebral ischemia of rats. Zhongguo Yao Li Xue Bao1998;19:104–8. Contributors C-YM formulated the concept and reviewed the manuscript, S-NW and C-YM drafted the manuscript. Funding This work was supported by grants from the National Natural Science Foundation of China for Distinguished Young Scholars (30525045), National Natural Science Foundation of China Major Project (81730098), National Natural Science Foundation of China (81373414), National Basic Research Program of China (2009CB521902), National Science and Technology Major Project (2009ZX09303-002), Medical Innovation Major Project (16CXZ009) and Shanghai Science and Technology Commission Project (16431901400).